Dawgs, mom says I have too much pent-up energy for this little dawghouse. Just this morning I was zooming in circles on the bed like a mad dawg. Mom bit her tongue, laughed at me, and even videoed it, but she says her technical ignorance is preventing her from posting the video so all of my beloved fans can watch me zooooooom. At home I get regular exorcisms by running free and playing frisbee, steeeek, and ball in the yard and in our field, and by taking long walks up and down our creek. Oh, and I also can run back and forth through the house chasing kitties and my cuzzes, as well as dragging spanky-spider and poundy-penguin through the house at a maddening pace. And when pop and I are outside doing man-stuff, I help him by biting at the tires of the lawn-mower and wheelbarrel, and distracting him by getting in his way with my toys. We’ve been going for walks around the RV park here, but it mom says it doesn’t exorcise my demons like romping on the beach did at Port Aransas. So she decided to try bike riding with me again. 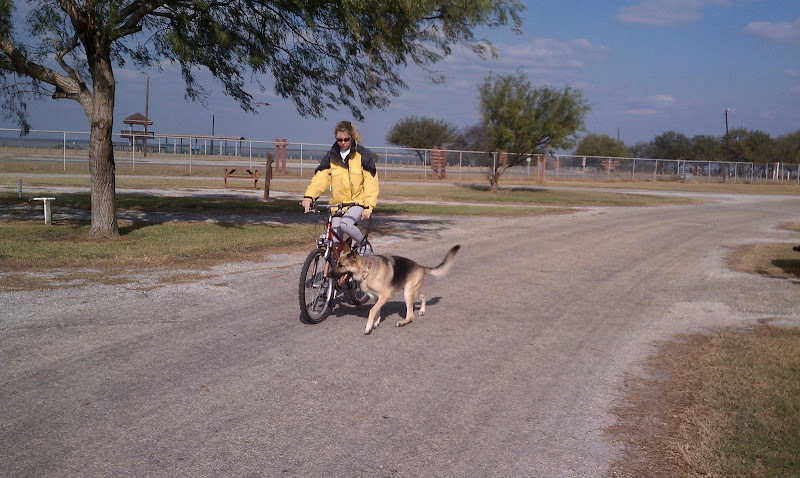 When I was younger and full of even more demons, she used to take me with her for bike rides. I would run beside her and do my bestest not to get my toes ran over. It took me a little while to remember. First, I just wanted to chomp mom’s tires. Here I am, taking aim. It took me a little while to get the hang of it again. Mom just wouldn’t go fast enough at first, so I kept getting ahead of her. And I didn’t remember left and right either to know what direction mom was turning at the intersections. 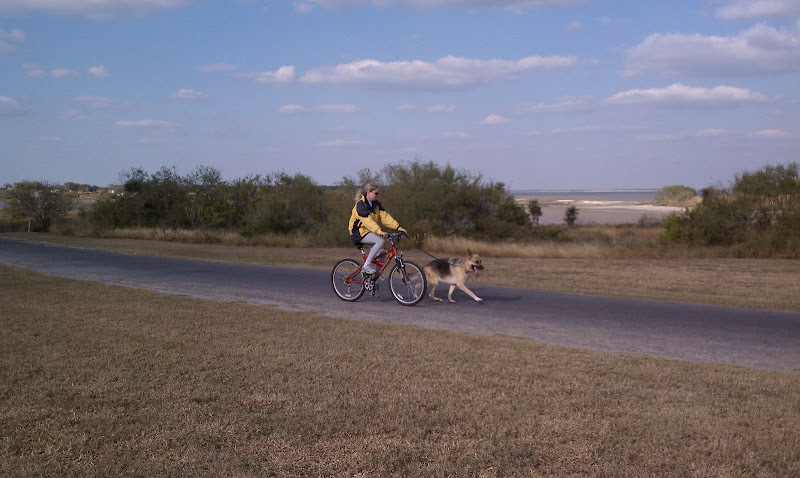 I only ran into the bicycle once, but that was because pop took off down a different road chasing a cool bird that him and mom saw. I kept looking over my shoulder to see where he was going instead of watching mom, and even as she was hollaring at me over and over to watch her, I drifted too far to the right and bumped into the bike. Then I got scareded and walked in front of mom’s front tire as she was trying to stop. She almost wrecked trying to keep from running me over. I wound up with a skinned foot pad, which really bites because mom says no more bike riding til it heals. And she said I might have to wear my boots again for running on the pavement so I don’t get any more owies. Anyway, all that exorcise did get rid of most of my demons. I am napping to get all rested up for bed time!